Mighty Simmers, on the Ides of March I present to you another exciting update! A turning point in your Simming journey, and control by which you do it. In agreement with Julius Caesar -- experience is the teacher of all things. We heard that the camera and virtual cursor movement was too quick, so we put the speed of the controls in your hands with new camera and virtual cursor speed adjustments. Change to your liking in the Game Options. Not only can you select how fast the cursor moves, you can adjust how much it accelerates to get the control scheme more to your liking. Someone also told us in quiet whispers that you like to place multiples of things without having to select it from the Build / Buy window each time. Be really quiet about it; but now you can use our new and improved clone stamp feature to place the same object over and over and over and over. Sometimes the UI got a little ahead of itself. Sometimes the part of the game you thought you were controlling wasn’t necessarily the thing the UI thought you wanted to control. So, we sat the UI down and told it to do as it is told. That means you should find yourself having to back out of UI elements less often. Unless you enjoy backing out of them, of course. The Grim Guitar now gets its own limelight on the Main Menu. You can check out how cool it is without even needing to load into a World. Plus, if you haven’t linked your account you can do that from the Main Menu to claim the Grim Guitar for yourself. Talking of the UI, there were some sneaky UI elements that chose to remain hidden until you found them. Those hidden bits of UI should now only show when you want them to. While we want you to know that adjusting the Sim count can affect your game, we won’t lock you behind a warning screen when you set it to Unlimited anymore. Some things can be so good that they name it twice, but that shouldn’t count the songs you write. While we aren’t dismissing the quality of your songs, we think you should only need to name them once before you can license them. Transferring Sims between households is great, but we heard that being limited to just the played households didn’t give you the options you’d like. Well, now you can show un-played households during transfers. If you worked through the Personality Panel tutorial, you might be wondering how it ends. Well with the addition of Tip 7 of 7 you can complete your tutorial journey. When navigating the Options Menu, the number of options could be overwhelming, with little to no information about what the options did. We found the tool tips for the Options hiding away and have put them back in their place, so now you can see what each option will do before you adjust it. Rotating roof tops might be limited to musical chimney sweeps but the ghost previews are not something everyone should see, so we dealt with them accordingly. Placing your family into a lot can be a tough choice and the first lot you pick might not be the one you want. Backing out of the lot will now let you pick another lot rather than deselecting your entire family. My Library felt a little too small with a limit of just 50 items, which feels more like a book shelf than a library. We knocked together some more shelving space from our neighborhood flat pack store and now it truly is a My Library to be proud of! When you are super proud of your creations, you want to describe them in detail for My Library to show. You can now scroll those extra-long descriptions rather than reading just the first part on replay. Whims can be so whimsical but that doesn’t mean you don’t want to pin them, all of them at times. Now you can do exactly that. Talking of Whims, if your Sim is out exploring the world or working you won’t get the hover tips for their Whims until they return to the active lot. Business decisions are important and occasionally you might get cold feet and want to backout. Previously the Sims selling you a business wouldn’t let you back out of your purchase. The authorities didn’t appreciate this, so now you can back out on the World selection screen if the purchase doesn’t feel right. Purchasing a restaurant in Live Mode will no longer cause graphical issues. Sims can now plan a social event while dining without causing you to watch the UI panel with no way out. 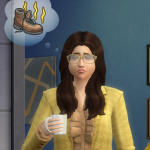 Editing your Host Outfit in CAS no longer leaves the menu active on screen. City apartments will no longer obstruct your view of the city when you decide to leave the apartment view. When you move to the big city you generally want to take your kids with you, at least until they reach adulthood, without losing functionality. While we addressed the functionality problem, we can’t help your kids get a job and move out even if they are in their 30’s. Sims can answer the call to work in the city without leaving you stuck answering the phone unless you have a chatty boss. Tooltips will no longer appear over the UI icons allowing you to see what you are selecting. The Spire Apartment no longer hides a secret hidden UI, we know you appreciate your Sims secrets, but this wasn’t one of them. Learnings from PC and Mac will continue to make their way into your hands, and various cleaned up bits and bobs from PC and Mac are now yours. My friends go off and learn, grow, and conquer. Enjoy!